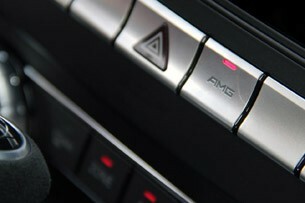 Autoblog rating for the Mercedes-Benz C-Class is not available. Please check back later. 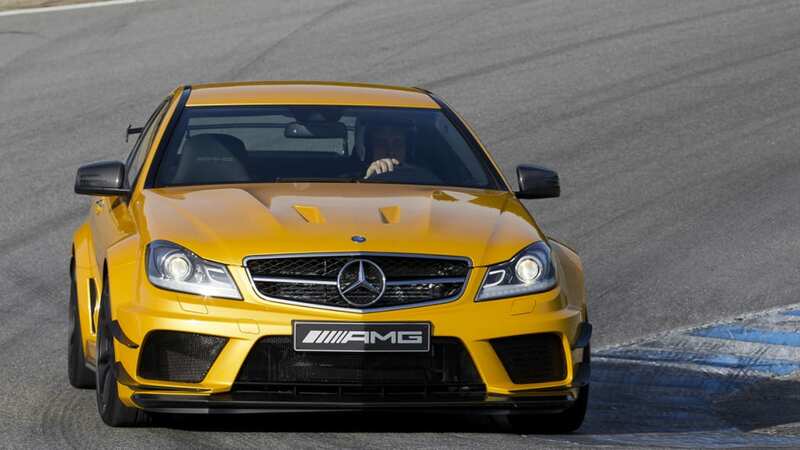 Turn Two at Laguna Seca is one of racing's more interesting creations. 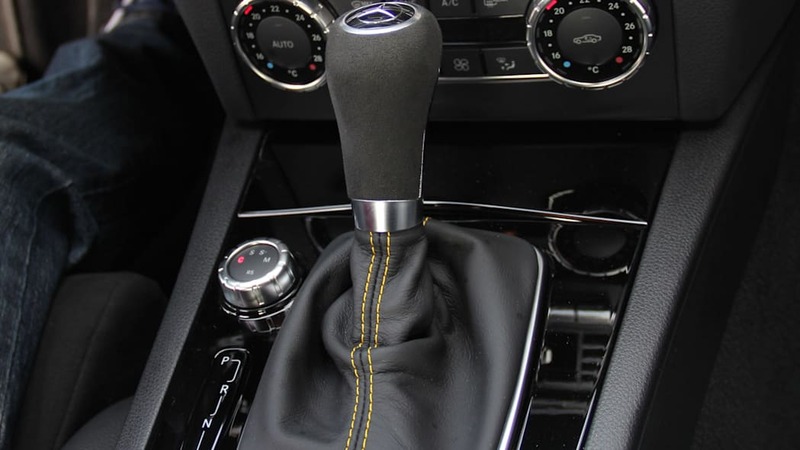 Get it wrong here and the rest of your lap will get really grumpy really fast. 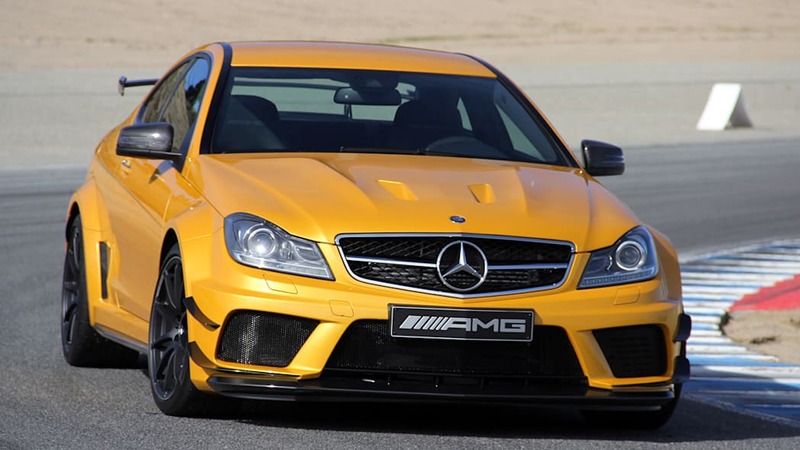 The AMG-Mercedes people thankfully gave us around 20 hot laps in their new C63 AMG Coupe Black Series over the course of the day – enough that we were able to get into a groove for the final 16 sorties or so. 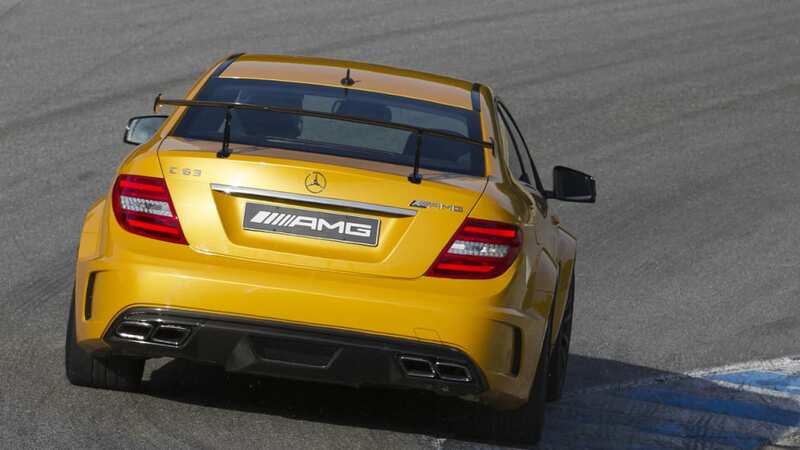 GT cars of about this size, setup and power tend to take to Laguna Seca like yuppies to mesquite. 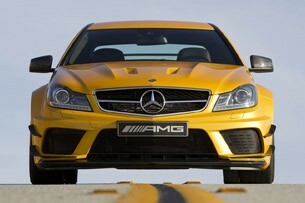 And so we cooked all day in a fully accoutered C63 Black Series. 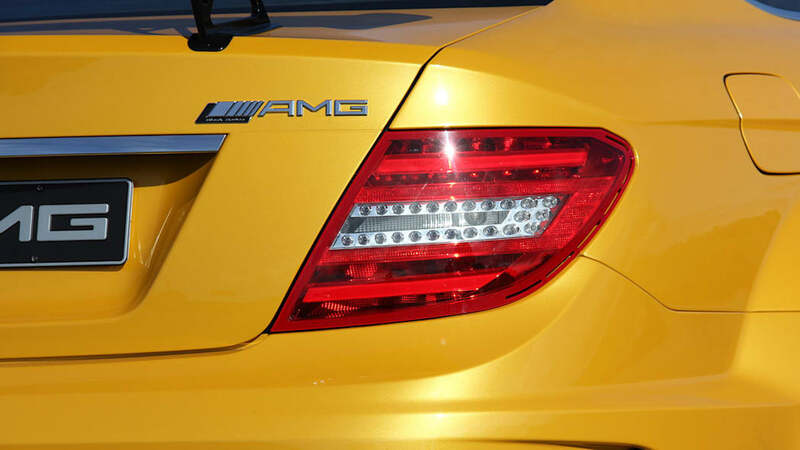 The fixins' on our coupe went well beyond the standard model's race-car-for-the-road spec: Track Package, Aerodynamics Package, AMG Performance Media suite, Exterior Carbon Fiber Package, 19-inch matte black forged light alloy wheels and a fire extinguisher. 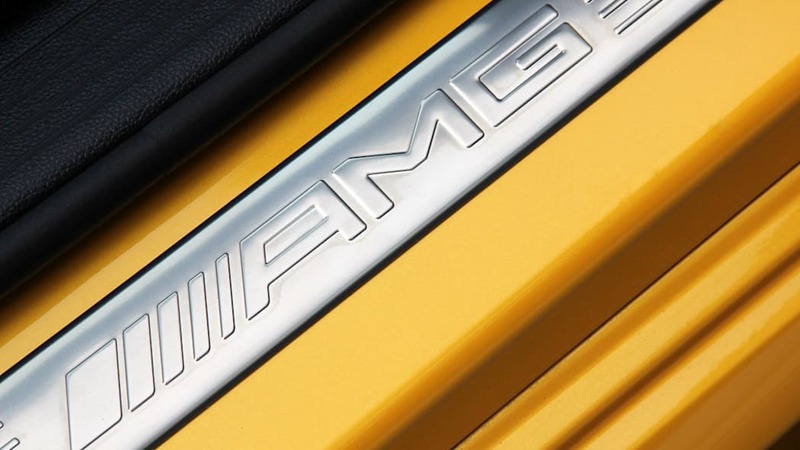 We'd have preferred if some of these options actually came as standard equipment, but last we checked, we don't own and run Daimler. Not yet anyway. 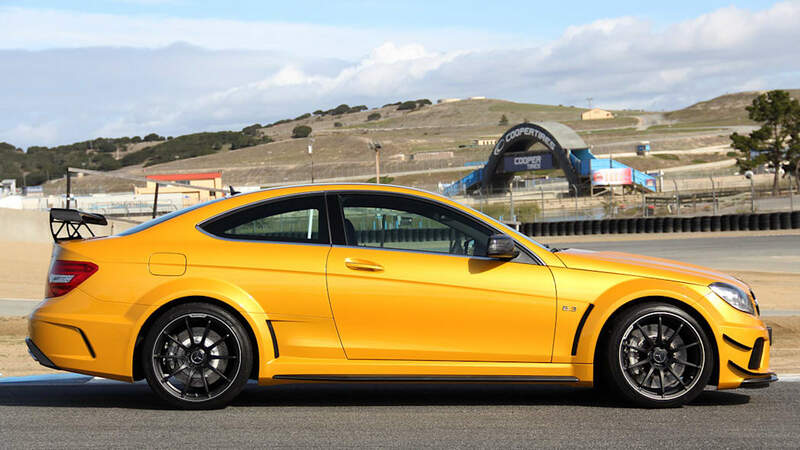 Goosing the well-weighted throttle pedal to the floor at the right moment in second gear out of Laguna Seca's insidious Turn Eleven left-hander, the C63 Black Series filled all of Monterey County with its divine quad-barrel noise. The sound was almost enough to make that difficult corner worth tolerating. 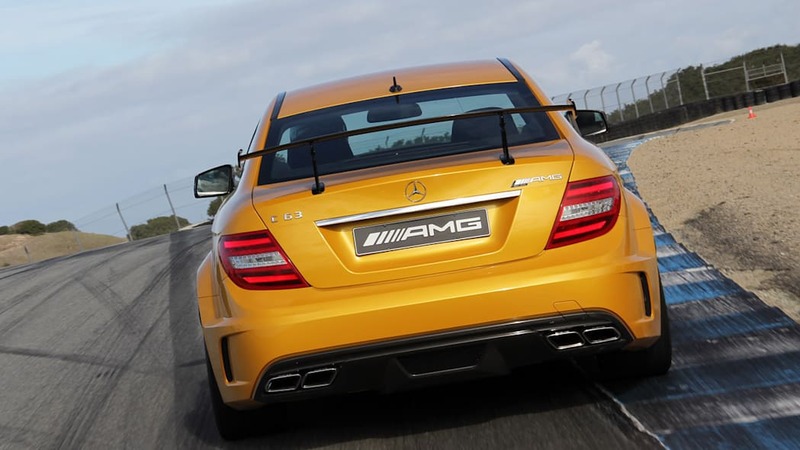 There are a few marquee straights in the racing world, and Laguna Seca has one of the very best. 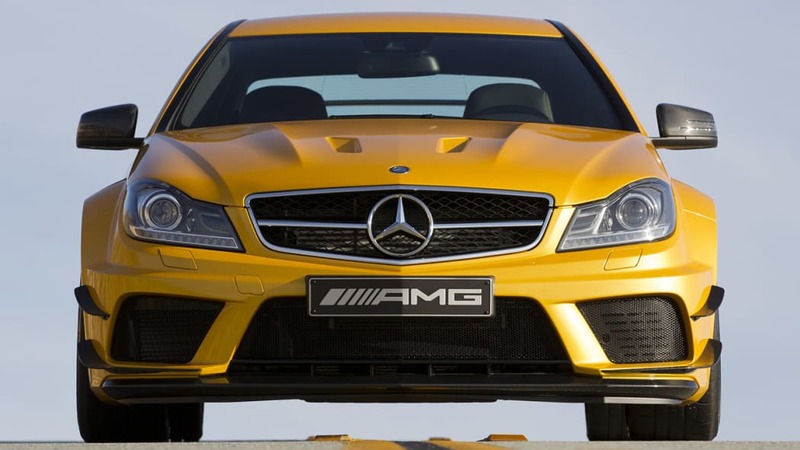 The C63 Black Series' 6.2-liter naturally aspirated V8 is an already legendary mill, and in this guise, it's damned close to perfection. 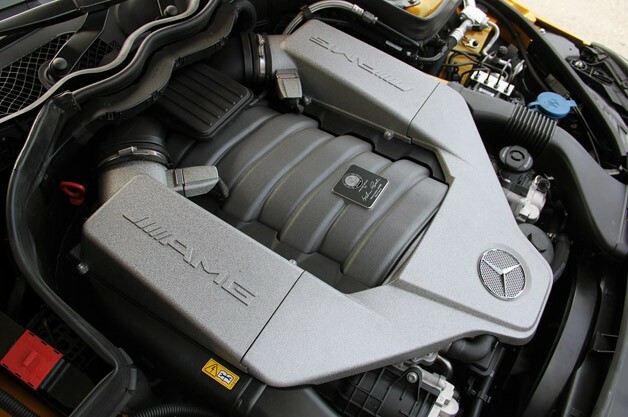 All along the slight left-bending straight with its blind crest (just prior to dive-bombing into Turn Two on hammered brake discs), this large-of-lung naturally aspirated V8 belted out its soundtrack like opera. 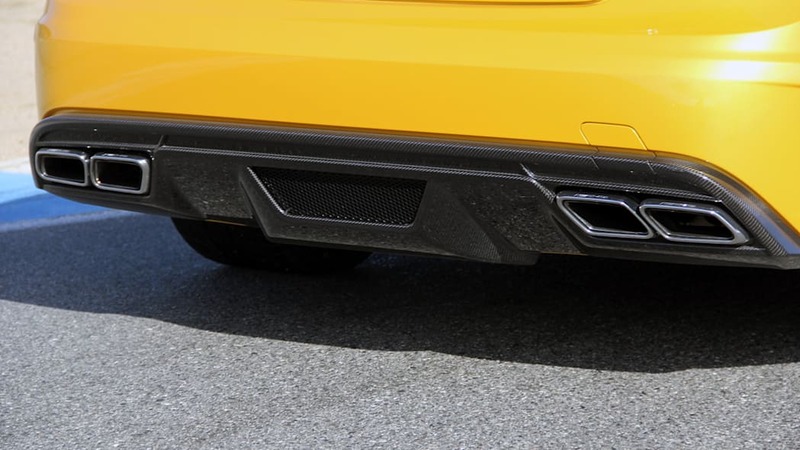 Its 510 horsepower peaking at 6,800 rpm and 457 pound-feet of torque maxing out at 5,200 rpm felt uncommonly flexible and at the ready. 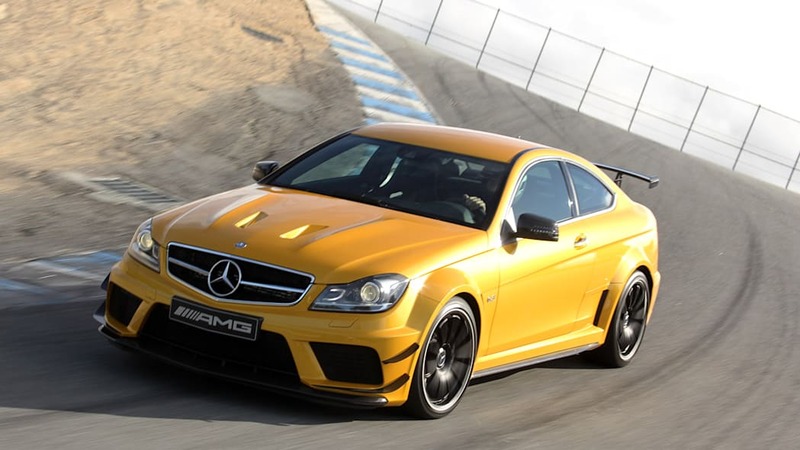 At a curb weight of 3,770 pounds, The Black Series isn't a featherweight, but it feels solid and mostly better for it. 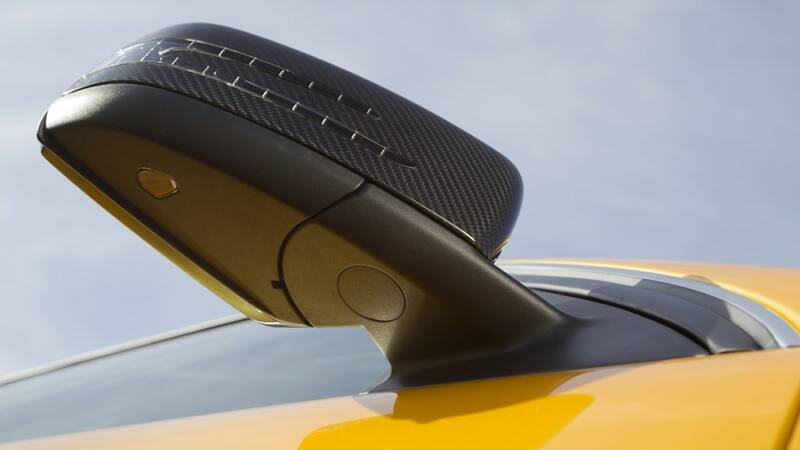 The requisite superficial bonehead percentage of buyers for this type of car should be kept to a minimum. 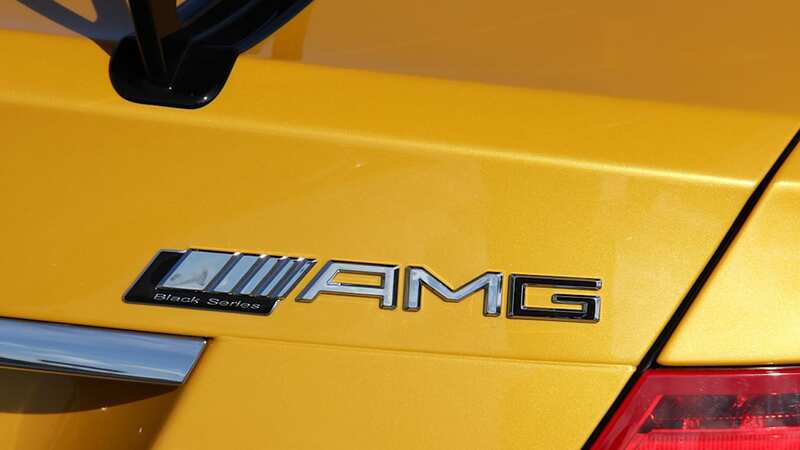 But is this Black Series (or any AMG, or Audi RS, or BMW M, or Cadillac V...) simply a poseurmobile, a trophy wife for well-heeled men gathering dust? 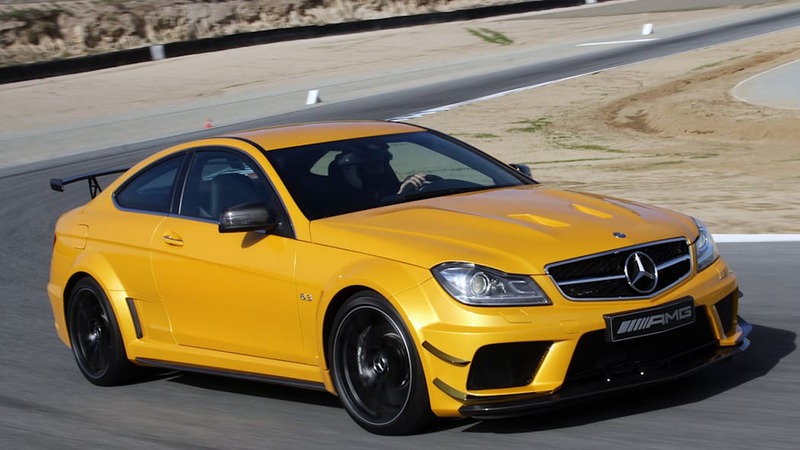 Barring the ten hours needed to debate this, just ask: Does the C63 Black Series really nail things dynamically to the point where its red meat attitude scares away the wannabes? 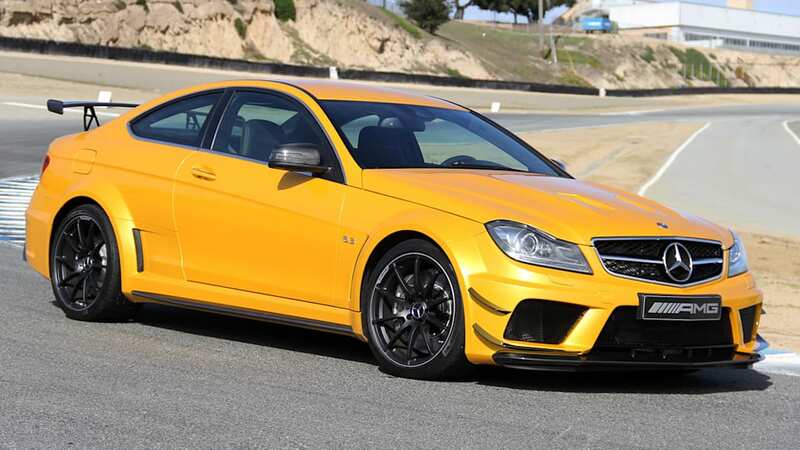 Our heaping dose of the Black – fully optioned, mind you – convinced us that this coupe has been done right. 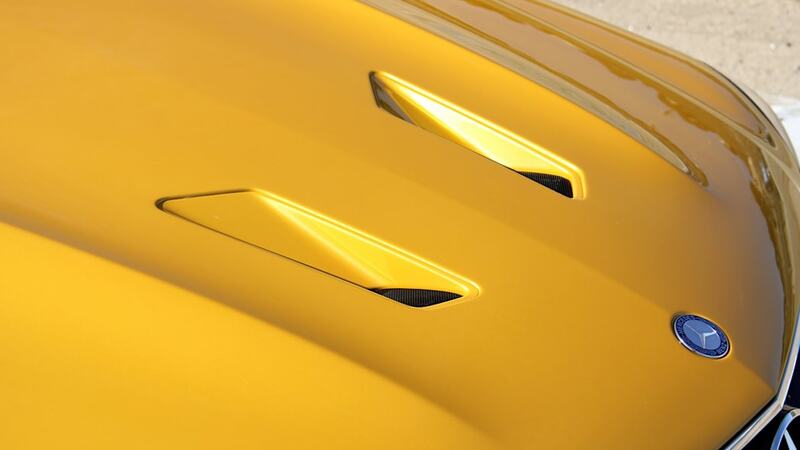 The requisite superficial bonehead percentage of buyers for this type of car should be kept to a minimum. 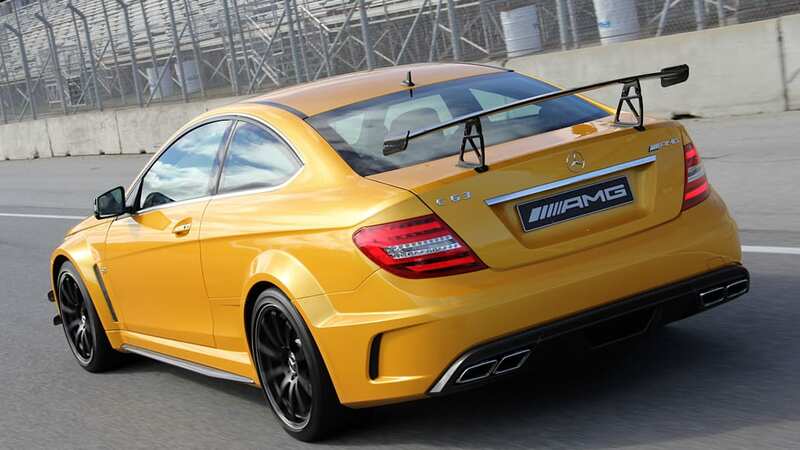 We hope this is borne out, because this is a terrifically balanced car that ticks all the right boxes in the way it handles at the hairy limits on a great track. 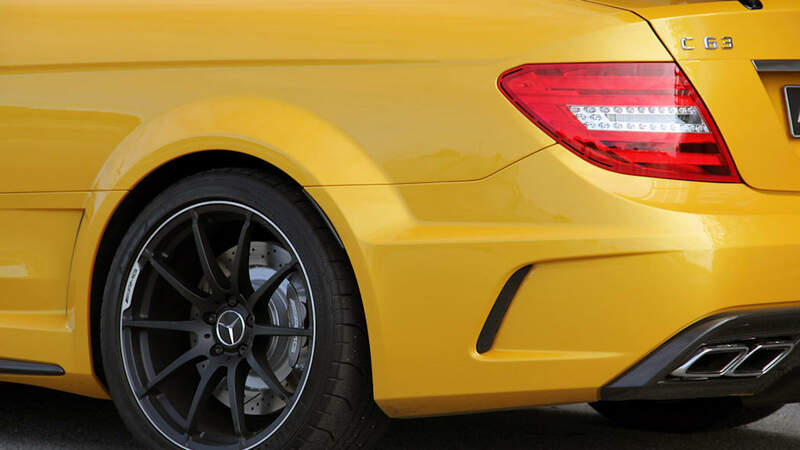 Like a Mitsubishi Evolution in its class, or a Porsche Cayman R in its habitat, this six-figure Merc deserves the best, most capable owners possible. 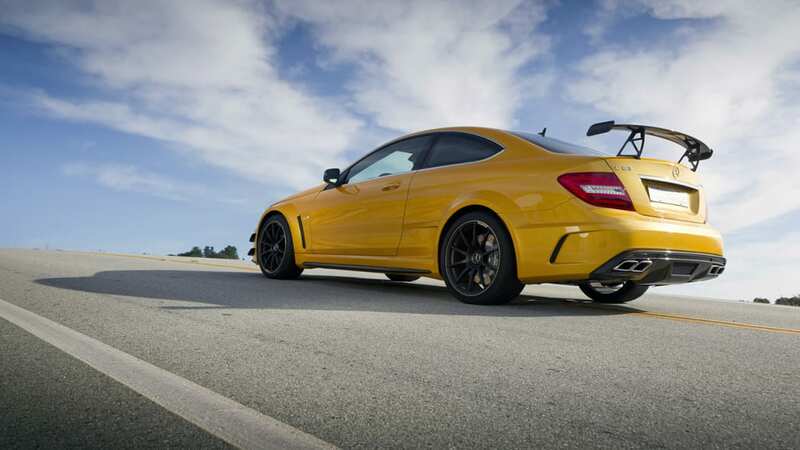 After learning the braking point down into the first left hairpin from 120 miles per hour, then understanding the most effective turn-in point, the C63 Black Series revealed itself through the curves that followed as an honestly race-inspired proposition. 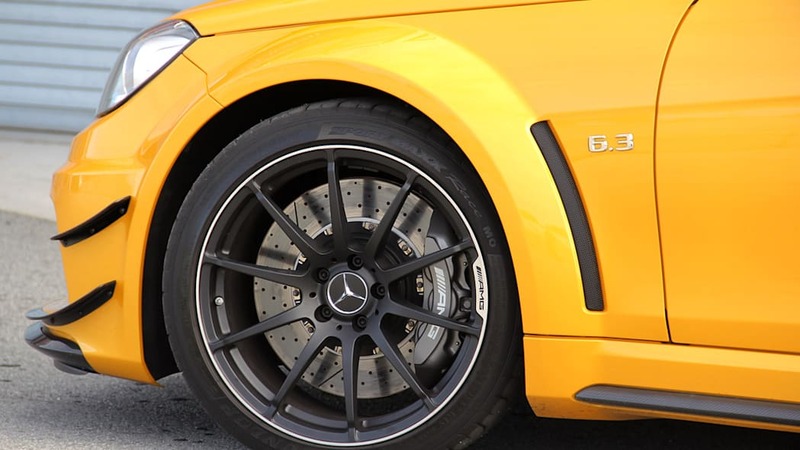 Each front 19-inch wheel weighs about 5.5 pounds less than a standard AMG wheel, while each of the rear wheels peels off around 6.5 pounds apiece. 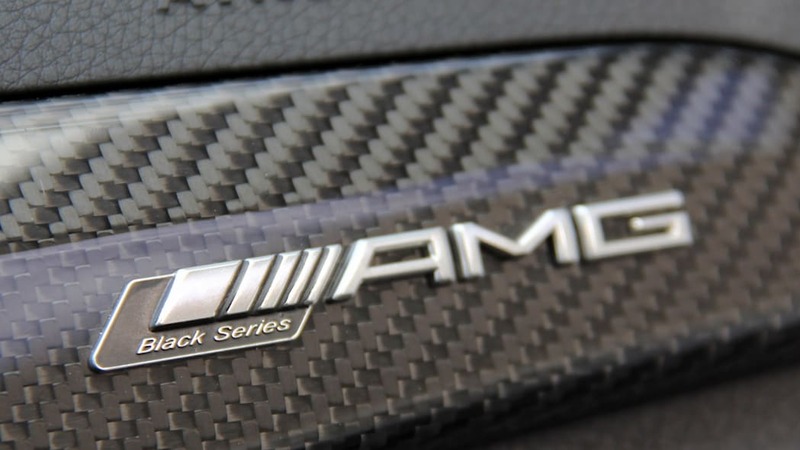 The AMG-specific speed sensitive steering ratio of 13.5:1 with a lock-to-lock of 2.2 turns has been made even more direct on the Black through an extra 1.6 inches of front track width, with the rear track swelling by 3.1 inches. 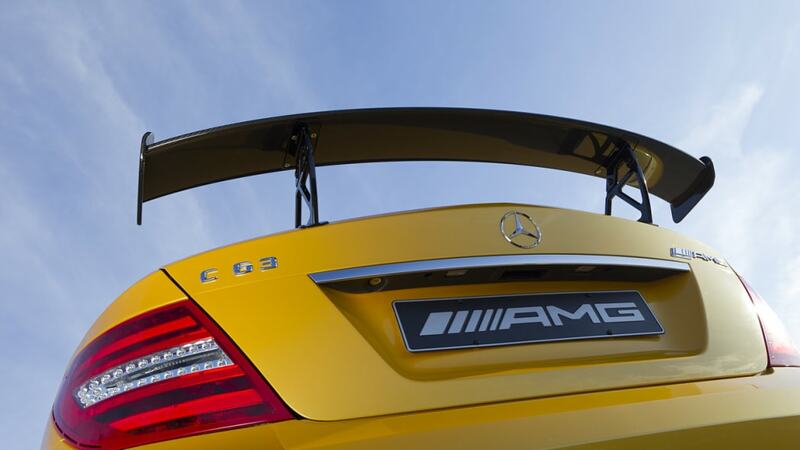 Top it all off with the sturdier coil-over adjustable KW damper set that lowers the car around six-tenths of an inch, clamp on 15.4-inch Brembo carbon composite brake discs up front, and it's plain to see that this AMG was designed to be a crisply responsive piece that belies its size. 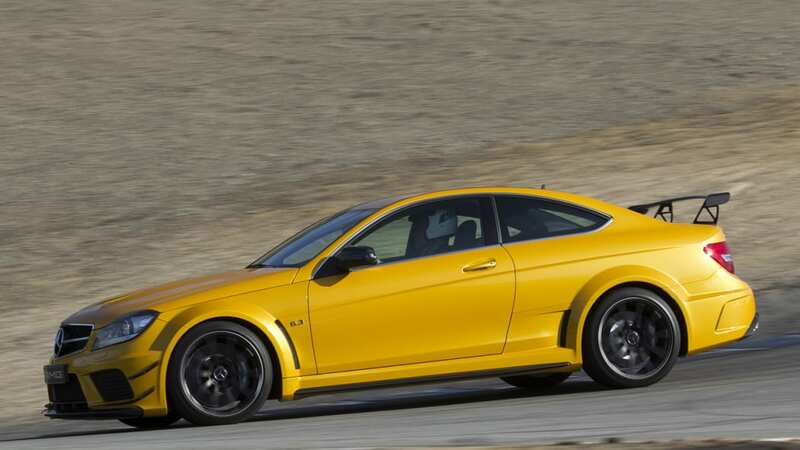 Throughout our time on this California playground, steering tracked faithfully to any line we aimed for, throttle response was immediate but not nasty, and we abused the brakes all day without any sign of excessive fade. 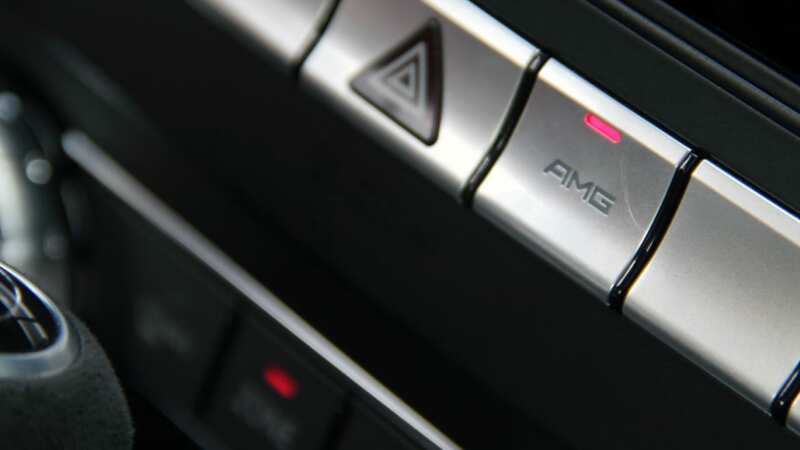 We kept the rotary dial for the AMG Speedshift MCT seven-speed gearbox (Controlled Efficiency, Sport, Sport+, Manual and Race start) in Manual all day, the three-mode ESP in its Sport calibration, and the optional AMG button (for all the interfaces of the Performance Media suite) lit red. 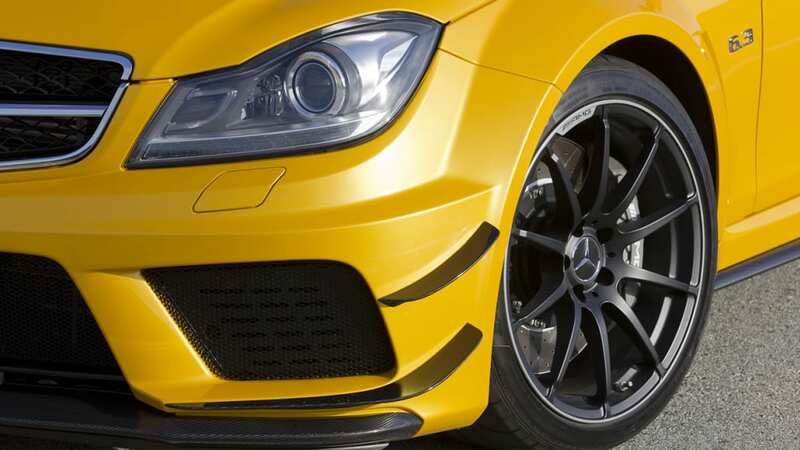 Improving our day-long track experience was the available Track Package that endowed our car with Dunlop Sport Maxx Race tires – 255/35 R19 front, 285/30 R19 rear – and a much needed small additional radiator mounted in the diffuser to cool the hard-working rear differential. 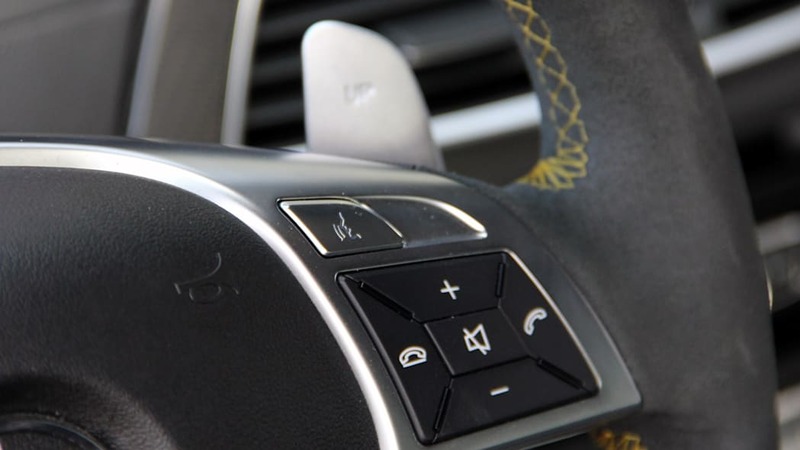 The latter, in case you were wondering, is a mechanical unit with 60 percent locking action in acceleration and 50 percent during deceleration. 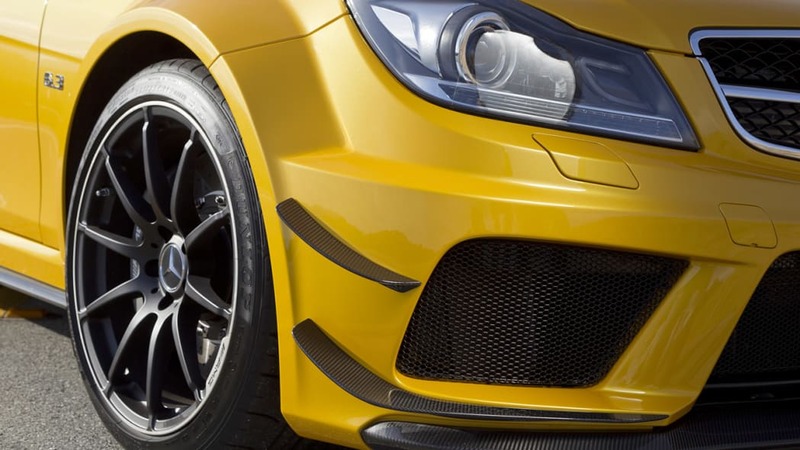 Standard tire size, by the by, is 255/35 R19 all around. 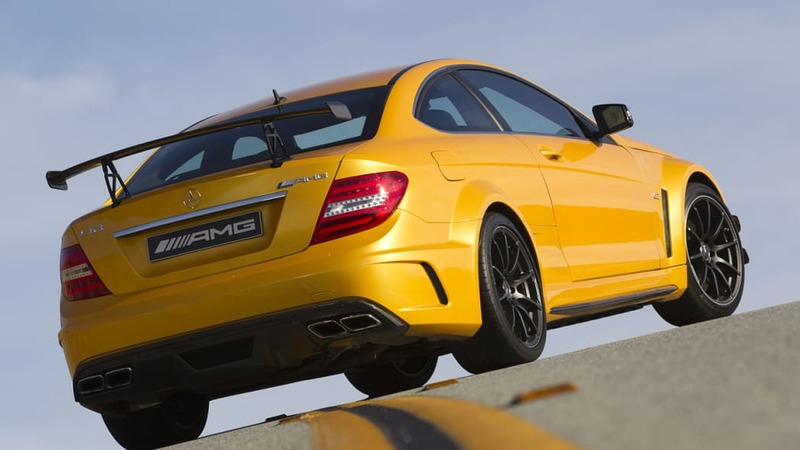 Thus tricked out, the Black Series comes very close to race spec, the diff's locking action out back having required some fine tuning of the suspension in order to neutralize occasional understeer. 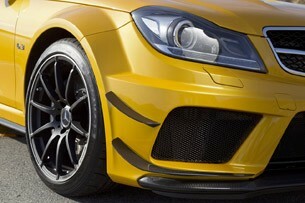 Camber on the front and rear wheels has been increased to help out in the dynamic fight as well. 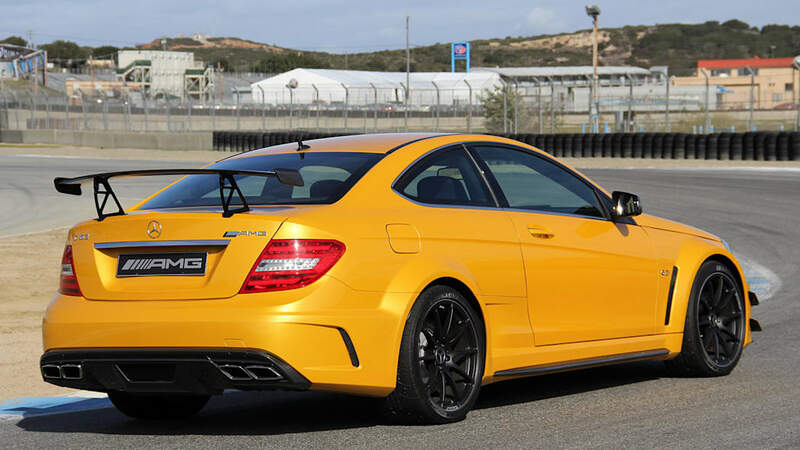 As prepped and set up to our dynamic liking, the C63 Black Series let its tail slip out just right to meet the correct line as we dialed in the power in second or third gear out of each turn. 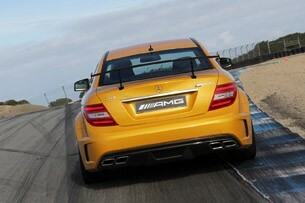 Only under the hardest of braking did we ever truly notice the car's weight, the nose lowering just a tick too much. 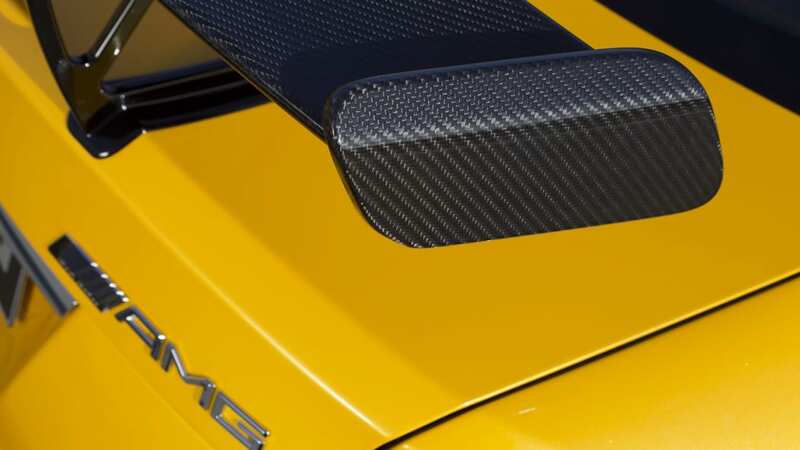 Maybe 250 fewer pounds and a lower setting for the dampers would do the trick. Aside from this, we were really pleased with the speed the Black allowed us to carry throughout this challenging 11-turn circuit. 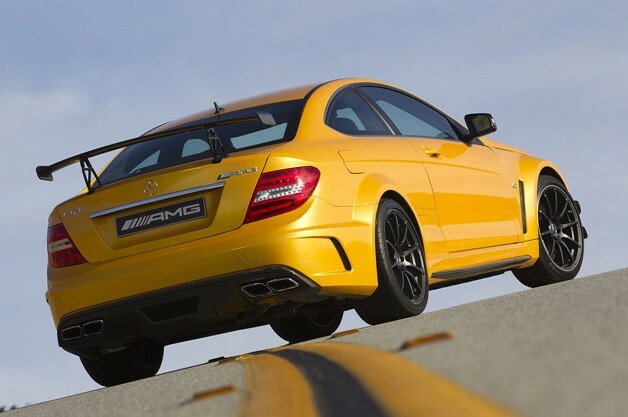 Plummeting through the Corkscrew in particular was more fun than any amusement park ride – there was no uncertainty whatsoever as the amped C63 dropped and sailed through without us needing to consult the brakes. 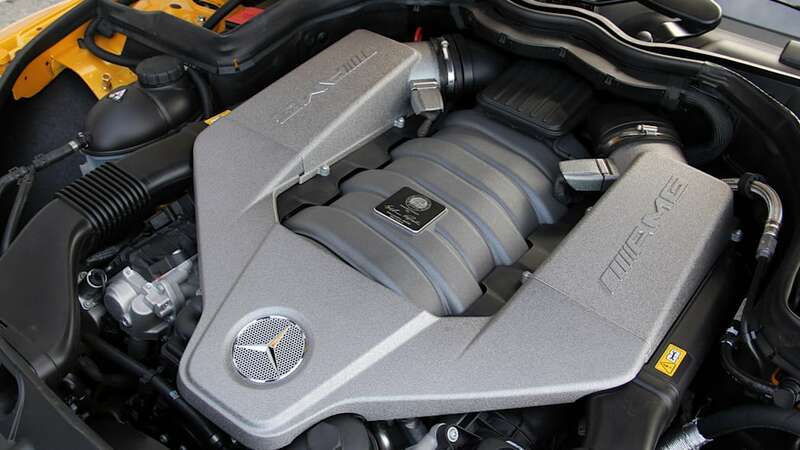 A more significant problem resides in this Benz's seven-speed gearbox and its paddle shifts in Manual mode. 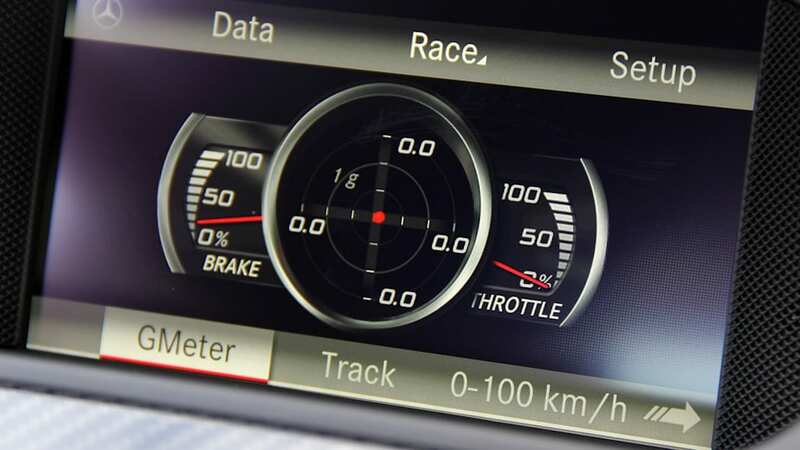 The software as programmed for our track time was entirely too slow and overprotective, with doable downshifts electronically disallowed because of a seemingly irrational fear of over-revving, and upshifts frequently took too long to be effected. 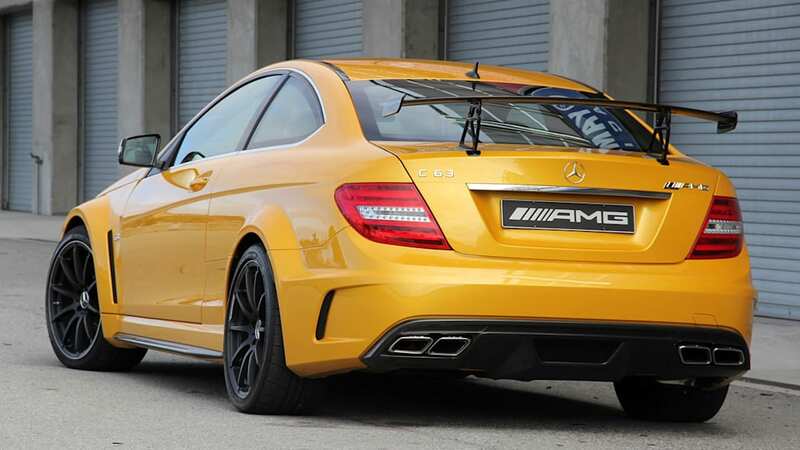 This is a Black Series with the Track Package and various other bells and whistles... we want our shifts and we want them now. 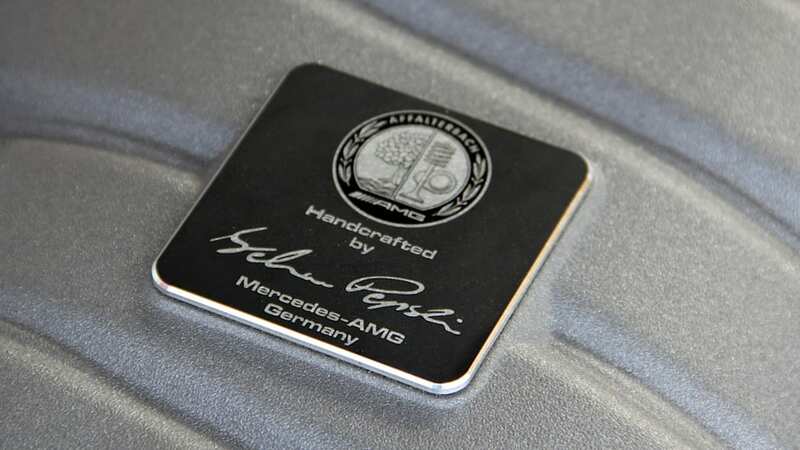 Director of all engine and powertrain development at AMG, Friedrich Eichler, completely agreed with us and others who shared this frustration. 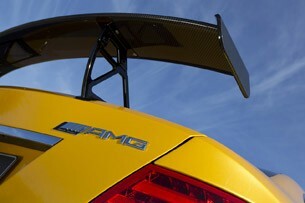 He and other AMG bosses pledged that a solution would be in place by the time European deliveries begin in January. 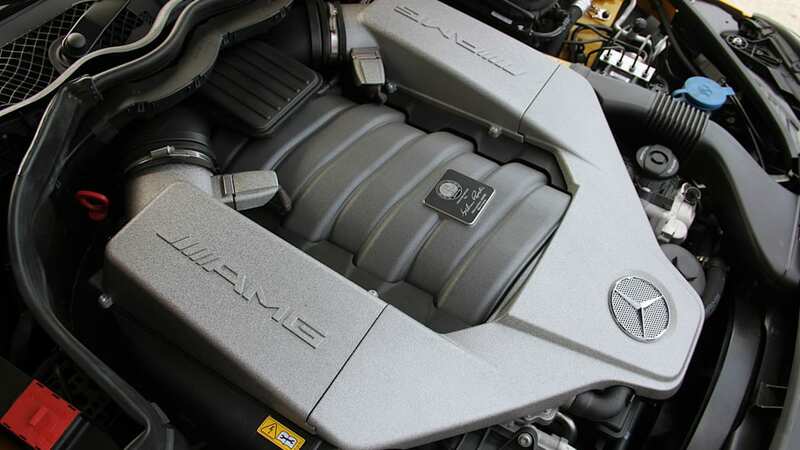 After all, this iteration of the M156 V8 has forged pistons, connecting rods and a crankshaft taken straight from the SLS AMG gullwing, so the stress tolerances of this engine should be more than up to the task. Affalterbach and Stuttgart needn't worry so much. 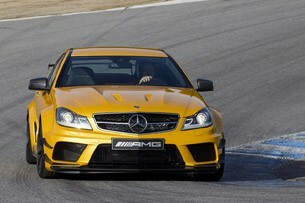 In the main, there were red and white C63 Black Series on hand for our track day. 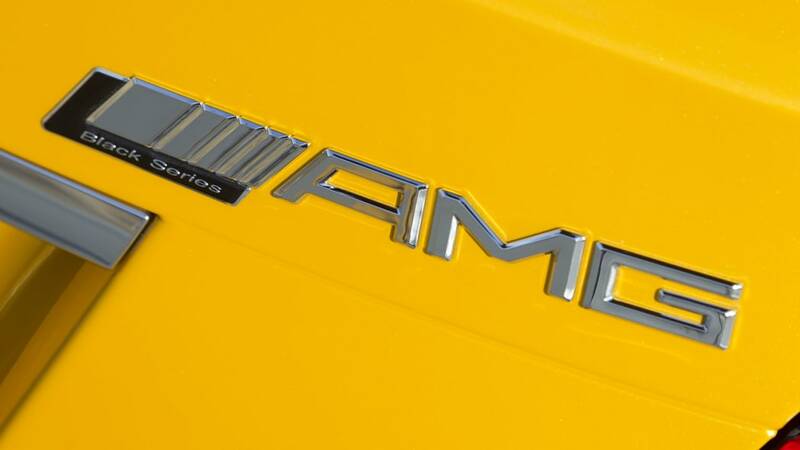 We shot our track video in a red car, but we just had to beg the AMG folks to hand us this bespoke "SolarBeam" orange example for photographic purposes. 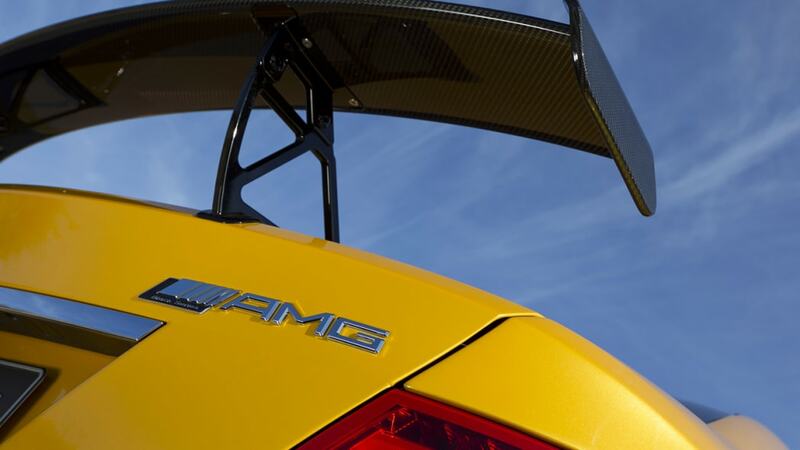 This brave color just looked the business thanks to its low-hung chassis, Aerodynamics Package with carbon fiber aero canards on the lower front corners and 50-inch wide, four-degree adjustable rear wing on seven-inch tall stanchions. 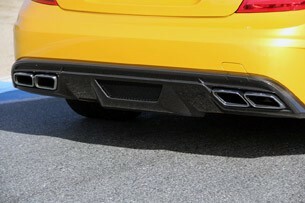 The blackened forged light alloys came off looking hot, too. All this heat naturally comes at a price calculated in fuel use: a full 21.1-gallon tank can theoretically last 406 miles. 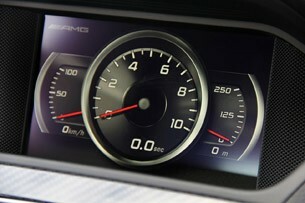 We burned through half a tank in our twenty flying laps, or around 45 miles. But who's counting? 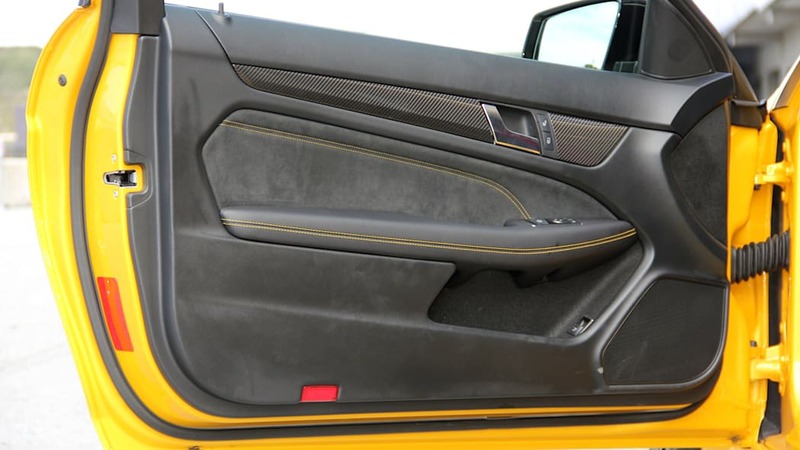 On the inside, the two seats are manually adjusted carbon composite buckets. 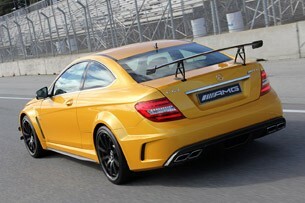 The rear chairs have been ripped from the cabin without mercy, not unlike the old CLK 63 AMG Black Series. 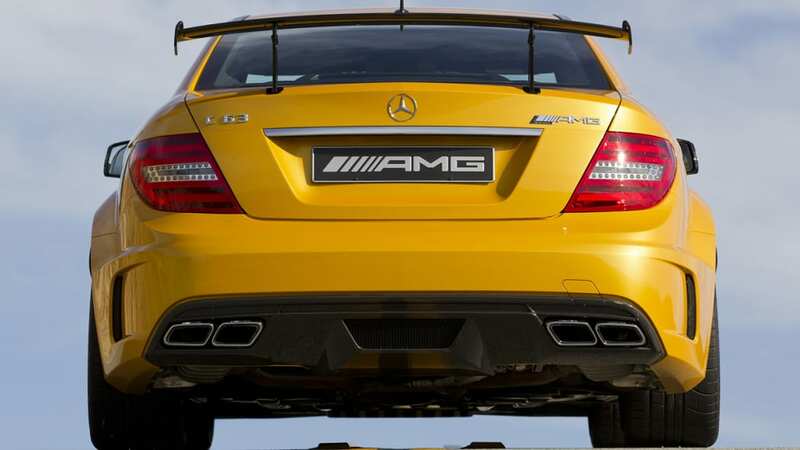 This is the main difference that accounts for the Black's slightly lower curb weight versus the standard C63 AMG Coupe. 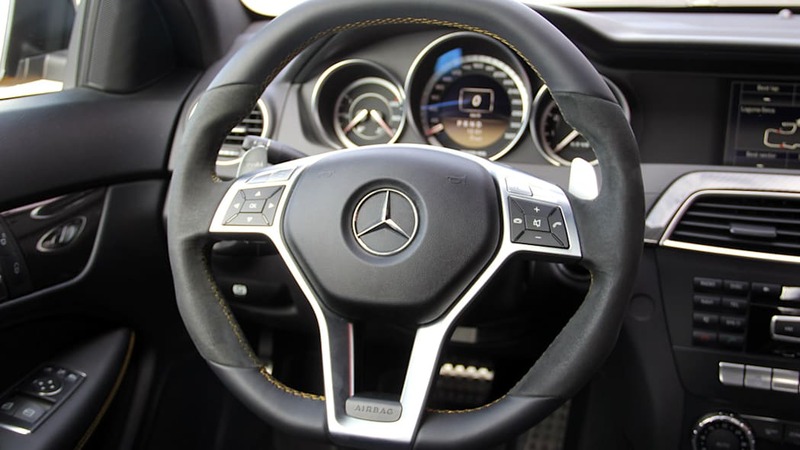 You'll notice the satin finish pedal set with grippy dots, the AMG three-spoke multi-function steering wheel and universally sporty carbon veneers. 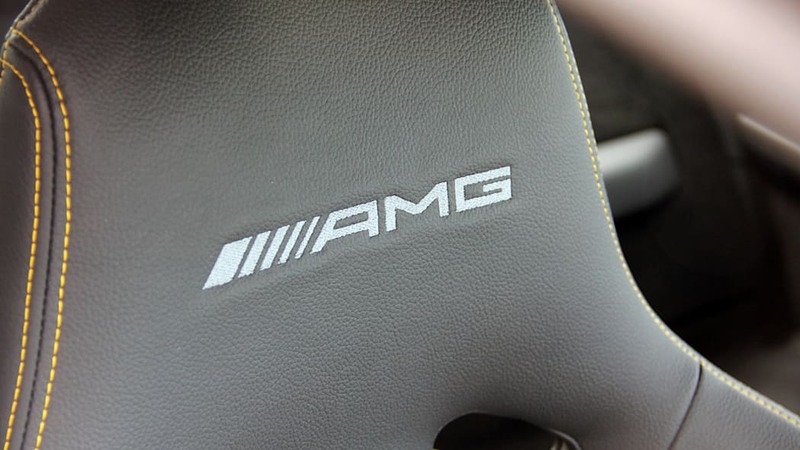 Throughout our day, the seats offered just the right amount of support whenever the lateral g-forces built up. Visibility to the outside world is reassuringly vast, so we didn't have to stretch our necks out of joint to determine where to place the inside wheel when cornering, and a decent view out back assured we could see our fellow hot foots storming along behind and calmly keep them at a safe distance. 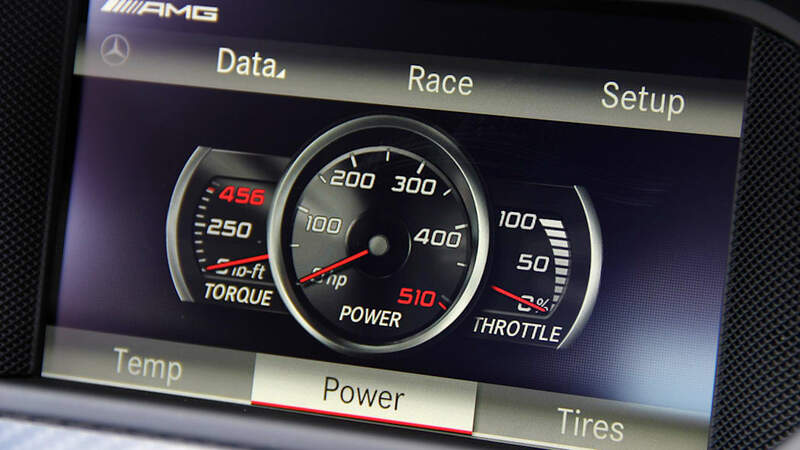 Fun and games ensue with the optional AMG Performance Media system that's programmed through the onboard COMAND display borrowed from the SLS AMG. 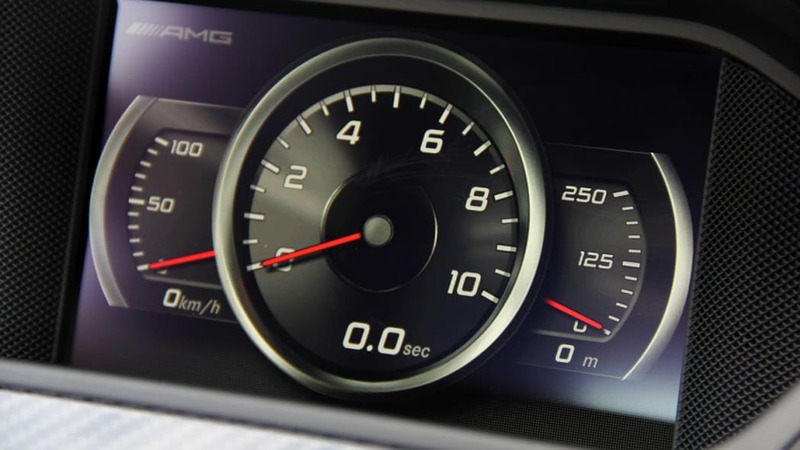 Its various functions work impeccably, to the point that it's almost a little too tempting to glance over at the readout while you're hammering along. 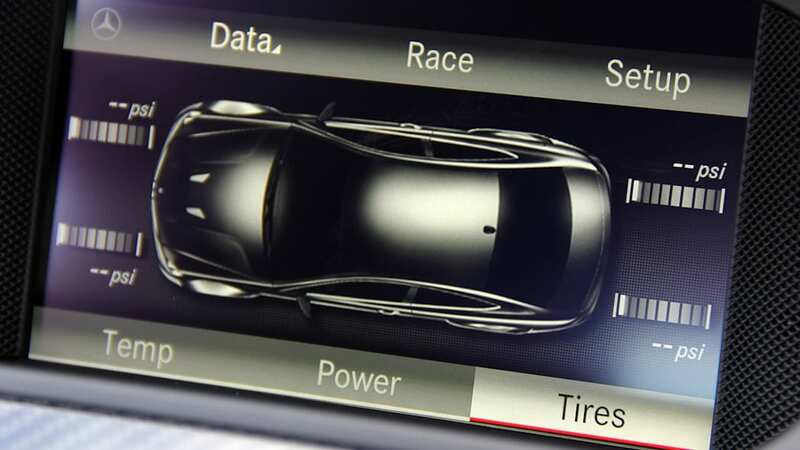 The informative details this system provides is likely one of the best driving school tools possible short of having a pro sitting shotgun (the g-force matrix and circuit lap time functions being our favorite), but it's important to keep one's eyes on the tarmac ahead. Roughly two-thirds of the way through our healthy lap allotment, we tore off a lap with the three-stage ESP overlord completely off. Man, oh, man, can there ever be little forgiveness if you get the line a little wrong through a tough corner. 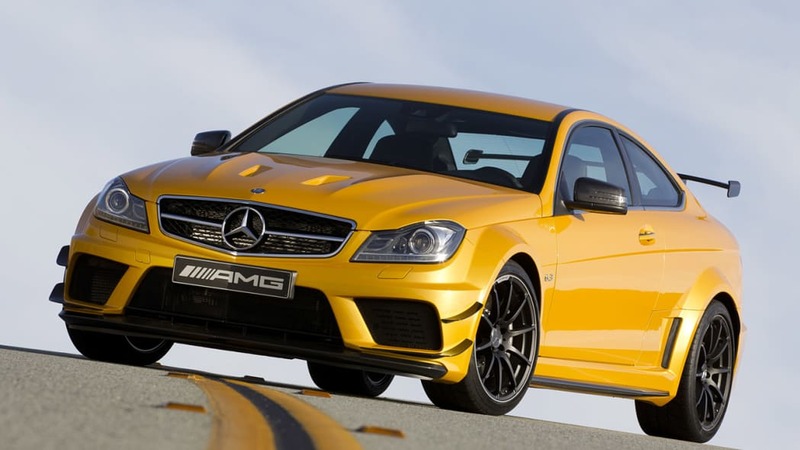 While the C63 Black Series is really well tempered and most miscues can be reeled by simply lifting off the gas a little, we'll need more time to figure the absolute right line at speed to fully trust ourselves when all of the AMG's nannies are sent home. 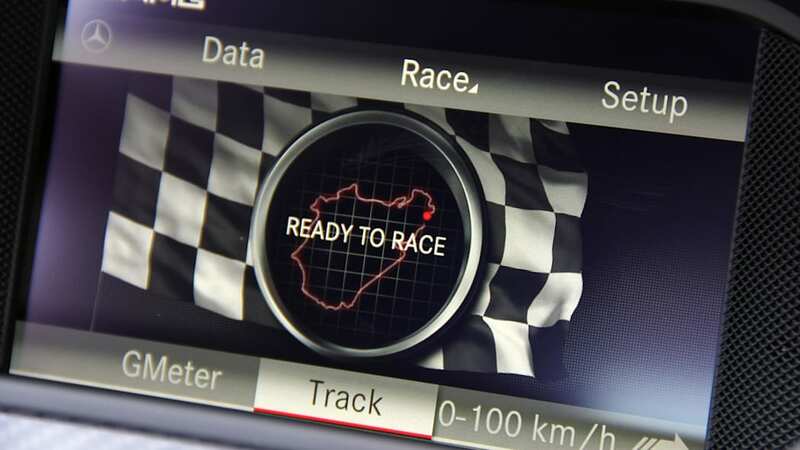 Besides, the Sport ESP thresholds on the Black are pretty liberal – enough so that we never felt the systems clamping down rudely and unnecessarily on our enthusiasm. 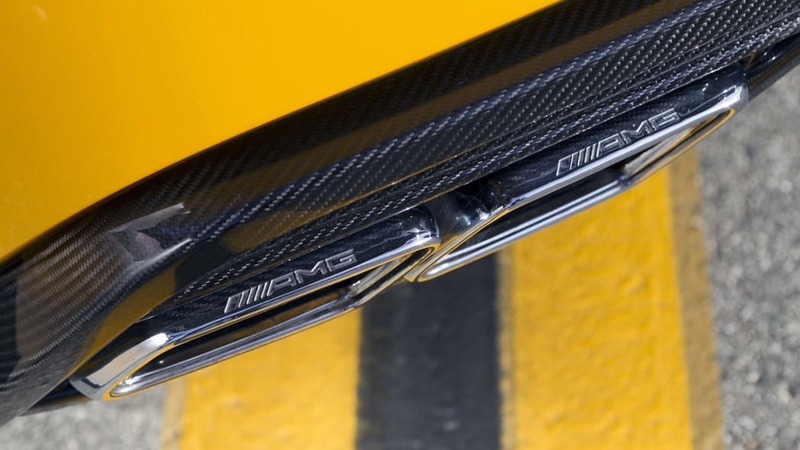 Lamentably, we didn't have the opportunity to try out the Black Series on the street (we'll have to save that adventure for another day), and we didn't have the chance to try the car's Race Start function, but AMG estimates 4.0 seconds flat for the run to 60 mph, and top speed is pegged at a respectable 186 mph. 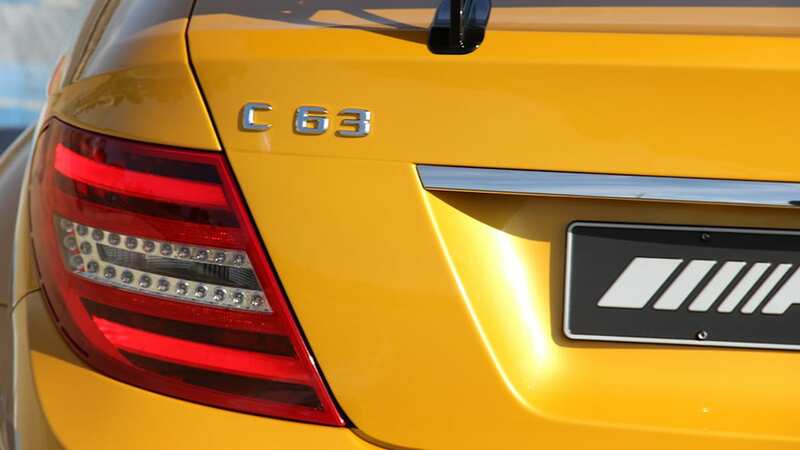 According to officials, there are no other C-Class Black Series models planned, and the coupe will be delivered only between January and May of 2012 with no set total production number announced. 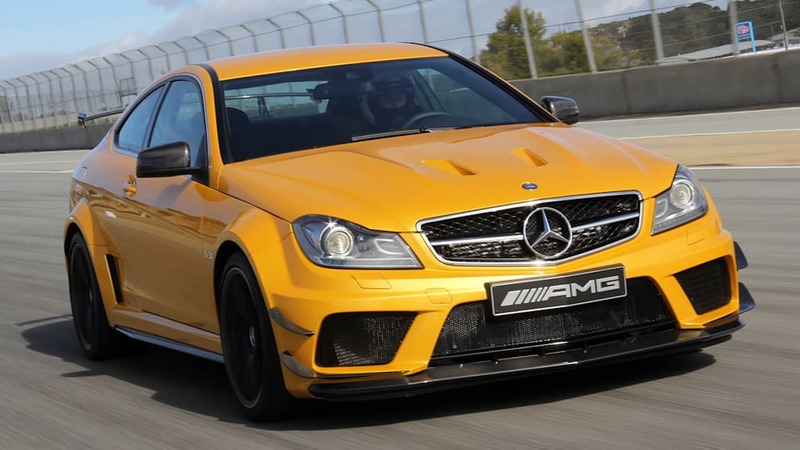 Pricing has not been disclosed yet, either, though we'd put the base price at around $125,000 and we don't expect any C63 AMG Black Series to leave a Benz dealer for less than $135,000. 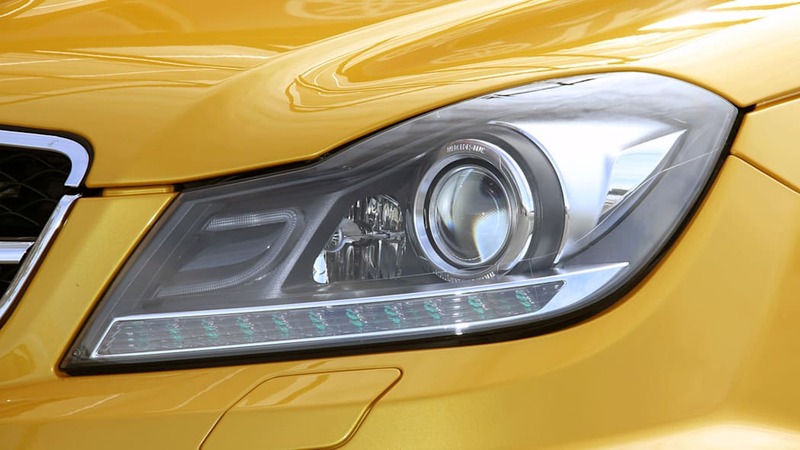 With fewer than 100 examples destined for the U.S., we wouldn't be surprised if there's some price gouging, at least initially. 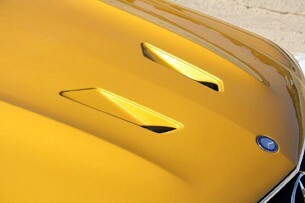 Provided Eichler and Company live up to their pledge to whip the transmission's electronics into shape – and even if buyers have to pay a bit more than sticker – we figure it'll be worth it for what amounts to a righteous, tire-smoking sendoff to one of the best V8s the world has ever known.